The Dutch like to make a fresh start for the New Year. That's nothing new because who doesn't make New Year resolutions? The only difference is that the Dutch take it literally. 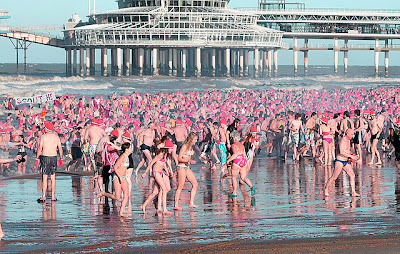 They plunge into the icy waters of the North Sea for their New Year's Dive or Nieuwjaarsduik in Dutch and eat Dutch pea soup afterwards. Strangely enough, they seem to enjoy this cold water adventure. Or does everybody come for the treat afterwards? Pea soup, a thick and warming winter soup. That is exactly what the swimmers need this time of year because the sea water temperature is 5ºC or 41ºF and the air temperature is 2ºC or 35ºF. The run to the sea is on New Year’s Day and starts at Scheveningen pier. Scheveningen is the seaside resort of The Hague. The first prize for this extraordinary bravery is a steaming bowl of traditional erwtensoep, pea soup. Unox, the soup makers and owned by Unilever, sponsors the event and supplies the soup, not only for the winner but for everybody present. Erwtensoep is a typical Dutch winter meal. It is made of split peas, pig's trotters and root vegeables - carrots and celeriac. Pea soup is a very thick soup. If you place a spoon in the middle of the pot, it should stay upright. If you like your soup thinner simply add more stock. My mother had her own recipe. She never used pig's trotters. "Unhealthy", she would say. Instead she used vegetable stock. 1. Peel and cube the potato, celery, celeriac and carrots. 2. Bring vegetable stock to the boil along with the split peas. Serve the soup with rye bread, smoked sausage or rookworst. If you can't get this type of sausage, Frankfurter/Wiener sausages are equally good. There is no need to swim in the North Sea first. You can eat Dutch pea soup any time of the year. If you would like to try this soup but don't want to make it yourself. I can recommend Dutch Split Pea Simmer Soup. It is as tasty as the home-made soup, and of course far easier and quicker to prepare. The soup sounds much more appealing than the dip int sea. Nothing like a good, hearty soup on a cold winter day.